The ovary is formed by three main compartments: superficial epithelium, cortex and medulla. The superficial epithelium is constituted by one layer of cubic cells. The cortex is a wide peripheral zone containing the follicles, the functional and structural unit of the ovary, and a stroma formed by compact connective tissue. Every follicle is formed by one oocyte surrounded by follicular cells, also called granulosa cells, and a basal lamina surrounding them. The medulla is the central region of the ovary formed by connective tissue with numerous blood vessels. As the follicles develop they change their size, morphology and physiology. Primordial follicles are formed by the oocyte surrounded by flat follicular cells. Primary ­follicles are characterized by the initiation of follicular growth. Secondary follicles are characterized by two or more layers of granulosa cells and no antrum. The early antral follicles are characterized by the formation and progressive growth of a cavity, due to the accumulation of a fluid. Once the antrum is formed the follicle goes through several stages: (a) basal growth, (b) selection and (c) dominance. The process of follicular growth is controlled by extra-ovarian and intra-ovarian factors and the importance of each of these factors depends on the stage of follicle development. Extra-ovarian factors regulate growth of antral and preovulatory follicles, while intra-ovarian factors regulate growth of preantral and early antral follicles. The ovary is not only involved in sexual reproduction, but also has great influence on the entire hormonal functioning during development of the organism. 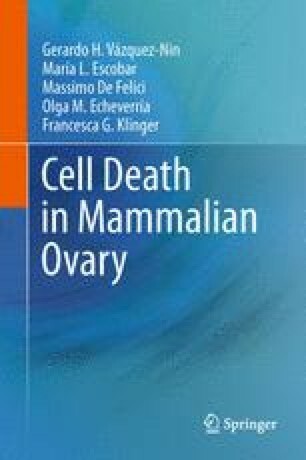 The ovary is the site of the highest synthesis and secretion of progesterone and estrogen in mammals and gives rise to cyclical fluctuations in the levels of these hormones in the blood. Before ovulation, granulosa cells mature to form the corpus luteum, which is responsible for the secretion of progesterone and estrogen.